The Taiwanese Acer has officially revealed its latest smartphone – the Liquid E2. The new smartphone sits right in the middle between expensive and budget-oriented smartphones and offers a MediaTek MT6589 SoC with four cores at 1.2 GHz and PowerVR SGX544MP graphics. Available in black and white the Liquid E2 sports a 4.5-inch sensor display at qHD resolution (960 x 540 pixels, 245 ppi), 1 GB of RAM, 4 GB of internal memory, a microSD card slot for expansion, a rear 8 MP LED camera with flash and 1080p video recording, a front 2 MP camera, a GPS receiver, 802.11n Wi-Fi and Bluetooth. The specs list also includes a FM radio, a microUSB port and a 2000 mAh battery that can power the device for up to 9 hours of talk time and 450 hours in standby mode. 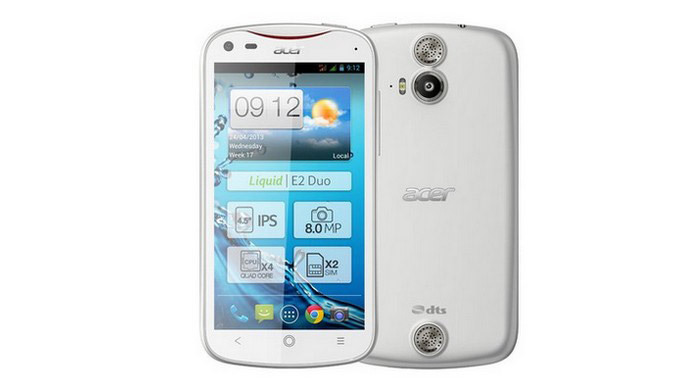 Measuring 131 x 68 x 9.9 mm the Acer Liquid E2 weighs 140 grams and runs Android 4.1.1. The smartphone will hit stores in May and will cost EUR 230. Acer will also offer one-SIM and dual-SIM versions of the same smartphone.